An Opinion On Sports: Alabama at LSU: Whose Dreams Will Die in Death Valley? 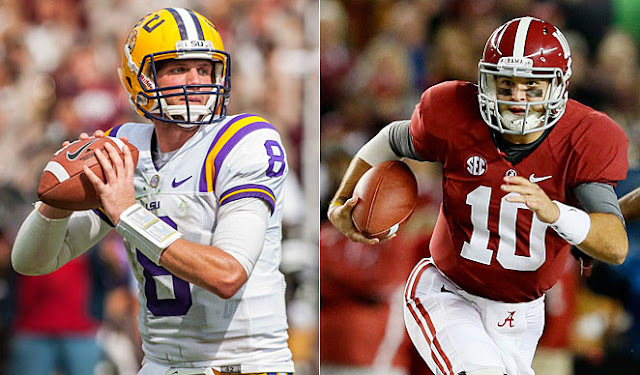 Alabama at LSU: Whose Dreams Will Die in Death Valley? For the third time in two years, the LSU Tigers and the Alabama Crimson Tide meet again on the gridiron. It isn't No. 1 against No. 2 as it was last year, but nevertheless it is a big ball game. Where last year's contests were virtually toss-ups, 'Bama enters the game as a solid 9 1/2 point favorite over their division rival. I don't look for the Tigers to get steam-rolled by Alabama as Mississippi State did last week, but I don't see the Tide losing either. Death Valley is a tough venue for opposing teams, but the 12th man theory won't be enough to pull the home team through this time. Les Miles said opposing teams dreams come to die in Death Valley, but there will be no tragedy inflicted on Alabama dreams Saturday night.